Public health officials in Krakow are poised to investigate an international tobacco fair due to be held in the city this month. The EuroTab 2011 event is billed as the “largest retail and distribution show for tobacco and smoking accessories” in Europe. But there are doubts about the fair’s legality – because promoting smoking in public places is an offence. The Polish Ministry of Health confirmed that a trade show of this kind, at which information and contracts are exchanged only between companies, was legal. The Krakow Post understands that Krakow’s Commercial Inspection department is considering the standing of the fair, and will intervene if it is found to be in breach of the law. Promotional material published on the Internet by EuroTab organiser Lockwood Publications does not state that the show is open only to representatives of the tobacco industry, or that members of the general public may not attend. The event website includes a ‘free entry’ ticket, with a nominal face value of 50 euro, to download and print. It makes no reference to regulations about the advertising or promotion of smoking. The EuroTab website is split into two sections, for exhibitors and visitors. The visitor section includes a registration form which requests applicants’ ‘type of business’ but does not state that registration is limited to tobacco industry representatives. Smokers who have posted views about the event, on public sites such as Forum Tabaczane, have made it clear that they intend to visit the fair in order to try new brands and blends of tobacco. Dr Karolina Liwosz, a trainee GP from Gdansk now working in Krakow, said posts on the forums indicated that events such as EuroTab were a danger to public health. She believed that tobacco fairs encouraged smokers. The Krakow Post contacted the organisers of EuroTab for their position regarding the legal standing of the fair, but received no response. However, the student organisation MANKO, supporting the Polska Bez Dymu (Poland without Smoke) and Lokal Bez Papierosa (Premises Without Cigarettes) campaigns, was more forthcoming. Working with the Krakow Post they brought the fair to the attention of the Ministry of Health, and now plan further action in protest. Smoking in enclosed public places was banned in Poland last autumn. Research conducted in Krakow last month by Lokal Bez Papierosa and MANKO student association found that the ban in the city had general support. Researchers asked employees at venues and members of the public – around 1,500 people in all – for their opinions and found that even among smokers, 68 percent support the ban. 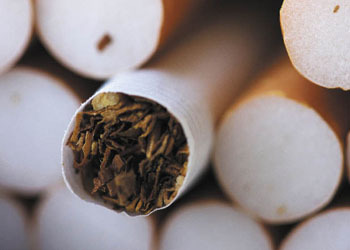 At European Commission level there is a drive to get Europe officially smoke-free – with bans in every country – by 2012. According to the EC, the number of smokers in the Union has been decreasing due to the bans but one third of the EU population still smokes. The EC notes that exposure to tobacco smoke is the largest avoidable risk factor in Europe and causes more problems than alcohol, illicit drugs, blood pressure, obesity or cholesterol. Philip Morris, one of the world’s largest tobacco firms, has a base in Krakow. Whether the company will be joined by exhibitors from around 60 countries for three days in April is, as the Post goes to press, very much in the hands of the city’s public health authority.